The bus crashed through a guardrail after the coach driving the bus blacked out from what is believed to be a medical condition. The AVCA has announced the 14 recipients for the Coaches 4 Coaches Scholarship, which awards coaches money to pay for convention registration and hotel costs in order to attend their first AVCA Convention. Nolan Michael Brand will serve 17 years in federal prison after pleading guilty to sexual exploitation of a child. Peter Samonte was the head boys’ volleyball coach at Independence High School in San Jose. What is a legacy? Is it a heritage of success? Is it the indelible impression left by one’s presence that remains long after that person has departed? Is it the inspiration of generations to come? For Caroline “Line” Found, Coach Kathy Bresnahan and the Iowa City West Volleyball team, the answer is all of the above. In a respectful biography of triumph, tragedy, love and healing set over the backdrop of high school volleyball, The Miracle Season tells the true story of the real people, the Hollywood production and the philanthropy of their legacy as detailed in the book of the same name, written by Bresnahan and the upcoming movie, which debuts nationwide April 6. 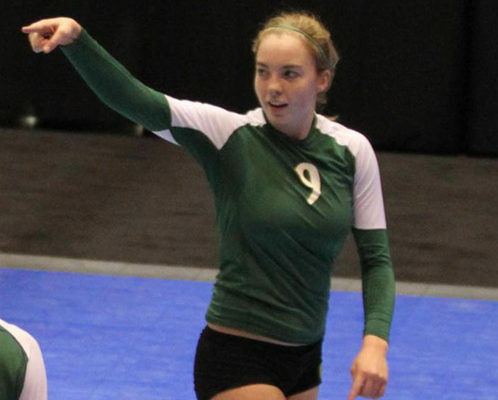 The Iowa City West High School volleyball team won the 2010 state championship with Found leading the way at setter. After Caroline’s death in a moped accident on Aug. 11, 2011, the team had to regroup and find their way without their friend and leader. For Bresnahan, the 2011 PrepVolleyball.com National Coach of the Year, who guided West from 1987-2000 and 2005-2013 and tallied 671 career wins, Line’s legacy, her team and the Miracle Season are still the source of much emotion seven years later. The memories are so raw and real, but ones that Bresnahan is happy to share with the world, despite the pain they may bring to bare. What follows is Bresnahan’s recollection of the people, events and process that led to both the book and the movie, which speak to Caroline’s legacy. The following conversation also discusses the foundation which carries on the spirit with which she lived in the Iowa City area. VolleyMob: Everything must be surreal for you right now with the book release and the movie coming out shortly. Do you feel like you are reliving the 2011 season all over again? It is almost like seeing a Hollywood-ized version of our story, which hopefully the book reflects. Earlier today someone sent me a picture of me with Helen Hunt from an online magazine and it was like, ‘seriously this is not who we are’. We are pretty down home. But, to watch the movie, especially some of the scenes which are so painful, like the funeral and Caroline’s mother walking at the funeral and the police coming to the door to tell them there had been an accident… Those things are so difficult to watch. It has been seven years, but it is just really hard. Where did you find the fortitude to push through the tragedy during that season? My job stopped being a coach for volleyball and my job became that of a guidance person. We truly were just trying to get through it. My assistant Scott Sanders was absolutely amazing as well at just trying to get them through each day, because practices were hard. As soon as we stepped between those lines, we knew she wasn’t there. There was such a void. I don’t know where you get that strength. I think any parent, teacher or coach, would do the same thing. You have your breakdowns on your own. There were several times that tears would well up and I would have to walk away. I don’t think we did anything better than anyone else. I think you just automatically want to protect your kids. We were one big loss from the wheels coming off. Where we ended up, people were like, ‘wow, you didn’t struggle at all,’ but every day was a struggle. We had a good record, but at any point, midway, at the start or at end of the season, had we dropped a significant match, we wouldn’t have made it to state. It was that tenuous of a hold with their sanity. It could have gone either way. The story is based on a real person – Caroline “Line” Found and the real events surrounding and following her tragic passing. What was it that made Line so special? Oh my heavens. If she would have walked into a room where you were working or something, she would have immediately walked over and introduced herself and within about 22 seconds you would have felt, wow, I am her best friend. It didn’t matter if you were an adult or a child. I spoke at her funeral and the person who spoke after me said, ‘wait, she texted other adults besides me’. She just made you feel so special. And then her other qualities were just her passion for life: she charmed everybody, she was spontaneous, she was a prankster, she loved to make people laugh. A lot of our special needs kids or kids who had no friends, she befriended everybody. There were no boundaries for her. Was she a different person on the court? She was one of the best leaders I have been around in 30 years of coaching, because she knew which buttons to push. One hitter might need a pat on the back after a perfect set and a swing out of bounds, and she would say ‘that was my fault, I got ya’. But, she made everyone play harder. She was very competitive, but still, every picture you see of her on the court, like at the net ready between serves, she is smiling. She just loved it. She was the most exuberant person and she was the biggest cheerleader on the court. Are there any moments from the movie that stuck out to you? At the end, after the credits, they morph from the movie into actual footage of our team singing Sweet Caroline at the state tournament, that was emotional too, but really cool. You recently were able to reunite with your players at the film’s opening in Los Angeles and stated you were most proud that they were still holding onto one another. What did that mean to you? They just automatically grabbed hands (on the interview stage)… When we went down to the crash site and as we walked half a mile down the road to where Caroline’s life was lost, that was painful for them, they didn’t say anything, they just automatically reached for each other. When they were nervous being in front of that type of crowd at the premiere, I just had to smile, because they were all just holding hands like they did. They are young women now, they are 24 years old, but they still rely on each other. Has this whole process brought the team, you and her family back together? We spend Christmases together. We are in contact all of the time. They had to feel okay about this movie or we wouldn’t have done it and Ernie (Found)’s other two kids had to feel okay about it. We really had to weigh for a couple of years before we said yes (to the movie), is the potential help that this story might bring people worth the pain that it could bring to those involved. You have retired from coaching now, but do you feel like Caroline’s legacy lives on at West? My former assistant is now the coach at West High. The legacy lives on. They still have their Live Like Line day and still have their T-shirts. We have never ordered another #9 jersey. We haven’t officially retired it, because I don’t think our school is real keen on starting that precedent, but we will never order another one. Helen Hunt, who plays you, and the other actors as well as the director (Sean McNamara) and screenwriter (David Aaron Cohen) spent time with you and the other people in the story to get a real sense of things. Do you think it is as accurate as it can be as a Hollywood-ized version of the story? They took some liberties. They make me look like Bobby Knight times three and that is so far from who I am. They portray it that Caroline’s dad didn’t go to any of the games and he went to all of the games. They gave Kelley a boyfriend. But, you know, the crux of the story is there. I don’t think in an hour and 35 minutes you could ever capture the emotion and the relationships. There were so many relationships that were amazing that season, not just between myself and the girls and themselves, but people throughout the state. I just don’t think they could show all of the heartfelt love and support that was given to us. We knew other people were going to try to compile some things because it really was a Hollywood ending. We talked about it and decided that if there was going to be a book out there, we should have something from our perspective and what we went through every day. It is pretty raw and pretty emotional. It is has been very well received so far and is #1 on Amazon in three different categories for sports. That makes me proud. I just wanted to share our story, not Hollywood’s and not somebody else’s. I was fortunate that when LD Entertainment started to work on this, they used the manuscript and really pulled out some big things to put in the screenplay for the movie. That made me feel good. How surreal was it meeting Helen Hunt and also seeing her play you on screen? She has been so great. She has autographed all kinds of stuff. Three charities asked for dual-signed copies of the book – by myself and Helen – to raffle. She has done so much to help the Live Like Line Foundation and I am still star struck. Today somebody sent me a picture of us from People Magazine and I was like, there is something wrong with this. And check out the Ellen DeGeneres show on April 12. Helen is being interviewed and I get to tag along in the audience. I am so excited that a volleyball movie is going to be talked about on Ellen DeGeneres. And that will only continue to tell Caroline’s story to a larger audience…. Now her legacy is going to live on. It is going to live on because this DVD and this book are always going to be out there. As many people as she touched alive, she is going to touch millions of people now. There are a lot of amazing kids like Caroline, but they are pretty rare. I know she was not perfect, she bent the rules as far as she could, but she never broke them. I know how crazy she drove me as a coach. She was just a good kid. Would you say that movie and this book aren’t just for volleyball fans? This is one of those good human interest stories. Faith based communities have really embraced it because it is such a family friendly story. In this day and age when there is so much negativity out there, this is just one of those really positive things. Is the slogan Live Like Line still a part of you and the community? It is huge. I probably get 5-10 people a week ask me how to purchase the T-shirts. We have a bench in town that says Live Like Line. It is more about how we live our lives: embracing others, being kinder to people. Immediately, the next day after her accident, two seniors came up with that slogan. I think the initial printing was 2500 pre-ordered T-shirts and that got doubled at least once or twice more. We have a Live Link Line Foundation that I started and we have a Live Like Line Facebook page and I get inquiries about the shirts all the time. The folks that have made the shirts all of these years have not ever kept a penny. They cover their costs and the rest is donated to the Live Like Line Foundation. I started the foundation a couple of years ago. It helps any student in the Iowa City school district that would not be able to participate in an activity due to finances. We want kids to be able to go to camps, participate in sports, whatever. This week, we paid for a student to take the AP test to get college credit for a class. The girl was Muslim and her father would pay for her two brothers but not her. Those are just things that break your heart. We also help kids play club volleyball that can’t afford it otherwise. We just don’t want money to be a factor in holding kids back. Any proceeds from the book will go there as well. It is not about making money. Editor’s Note: To learn more about or donate to the Live Like Line Foundation, click here. You can also follow Live Like Line and the Live Like Line Foundation on Facebook. The Miracle Season book is available for purchase on Amazon.com or through KCI Sports Publishing. The Miracle Season movie is set for release nationwide on April 6. (l to r.) Ernie Found and William Hurt on the set of THE MIRACLE SEASON, an LD Entertainment/Mirror release. Erin Moriarty stars as Kelley Fliehler in Sean McNamara’s THE MIRACLE SEASON, an LD Entertainment/Mirror release.